Splendid fairy wren (Malurus splendens) left and Superb fairy wren (Malurus cyaneus) right. The females of superb fairy-wren (Malurus cyaneus) start singing to their unhatched eggs in order to teach the embryo a “password,” a single unique note, which nestlings must later incorporate into their begging calls in order to get fed. The researchers published their findings in the journal Current Biology. This trick allows fairy-wren parents to distinguish between their own offspring and those of cuckoo species that invade their nests. The females also teach the pass-note to their mates. 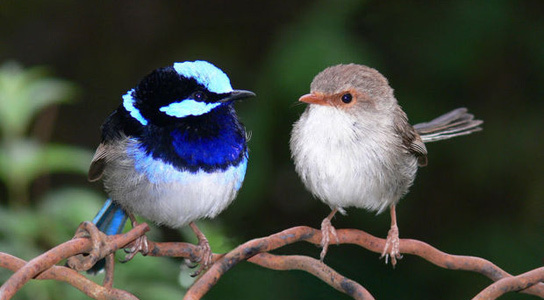 It has been shown that fairy-wrens discriminate against cuckoo nestlings on the basis of their foreign begging calls, but it wasn’t known that wren nestlings learned these pass-notes before they actually hatched, states Sonia Kleindorfer, an animal behaviorist, at Flinders University in Adelaide, Australia. It has never been shown that there is learning occurring in embryo stages, Kleindorfer continues. This has the potential of opening up new lines of inquiry into prenatal learning systems. The researchers discovered this by accident while recording at the birds’ domed nests in the search of anti-predator calls. They noticed that female fairy-wrens were singing to their eggs. The team analyzed the recordings over a full nesting cycle and found that the wren nestlings were given all the same begging call, which was unique to their nest. The call contained a signature element present in the call the mothers had made while incubating the and in the call she used to solicit food from the father. When the scientists broadcast a foreign nestling call at the nests, the female and male adult birds refused to feed the chicks. The scientists wanted to see if the call was genetic or learned prenatally. Kleindorfer swapped around 22 eggs. When they hatched, the nestlings used the call taught by their foster mother, not their biological one. Even though cuckoo eggs get incubated alongside the wren’s eggs, they don’t have enough time to learn the pass-note. The lessons begin 10 days after the eggs are laid, which gives the wren embryos around 5 days to learn the call. 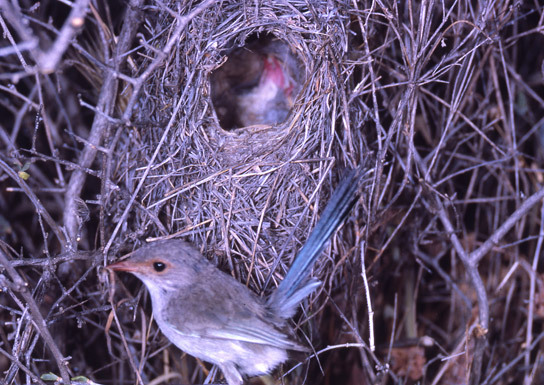 Cuckoo eggs only get about 2 days, meaning that fairy-wrens can leave the cuckoos behind. Wren’s aren’t perfect at spotting cuckoos; they catch the cuckoos only about 40% of the time. Cuckoo nestlings attempt to guess the pass-note by trying out different calls. This study opens up the possibility that adults can communicate information to their young even before they hatch. Be the first to comment on "Eggs of Superb Fairy-Wren Learn Before Hatching"